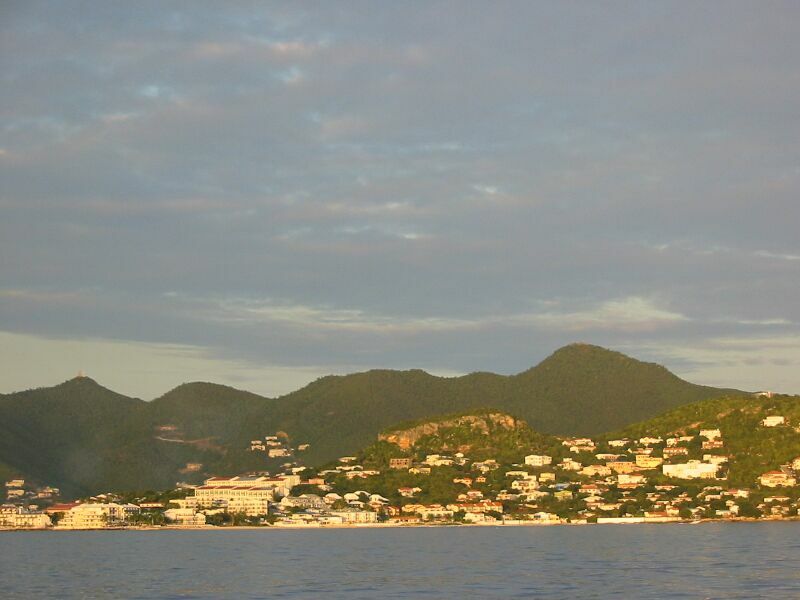 Saint Martin mostly consists of one large island that is divided roughly in half by two countries. Saint Martin on the north side is the French half, and Sint Maarten on the south side is the Dutch side (the Netherlands Antilles). 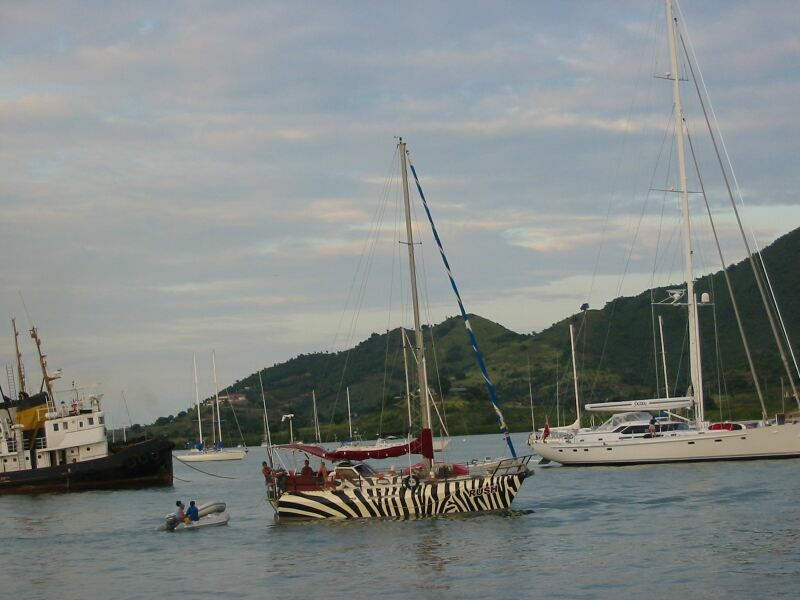 PatiCat arrived in Sint Maarten at Simpson Bay on December 14 in the morning after a good passage from Anegada. We chose to leave Anegada on Friday evening (even though it was the 13th - :-). The only challenge we had was the wind - which veered onto our nose most of the way. We had 9 or 10 tacks during the night which put us within 4 hours of the port. At that point we decided to motor the rest of the way so we could arrive in time to enter customs and still get into Simpson Bay Lagoon through a bridge which was scheduled to open at 11:00. We arrived at just before 10:00, and had no problem entering customs in time. The bridge had some construction work, so they didn't open it until about noon. We anchored in the lagoon. Karen and Frank needed some rest after the night passage, so we pretty much had a rest day on Saturday. On Sunday we went ashore to get our bearings. We quickly found a nice movie theater and Harry Potter was showing, so we made plans to go that evening. We also found a marina willing to let us park for a few hours so we could wash the salt off PatiCat. We had to med moor (you drop your anchor and back up to a dock instead of pulling alongside). The only problem was we managed to drift over the submerged mooring line of a nearby boat and slightly wrapped the line around our prop (only three wraps before Frank quickly shut off the motor). Frank made a quick dive and got us off, and then we completed the mooring. We spent a few hours washing PatiCat down until she literally gleamed in the sunshine. The girls were a big help! Karen spent most of the time working on cleaning the inside - which was quite hot work considering we had the hatches closed to wash the exterior. The marina manager came by to tell us she was leaving early, and we offered to settle up - she noticed how hard we were working and offered to let us stay for the night at no charge! We thanked her profusely as it made it much more practical to make the movie. We actually decided to treat ourselves to two movies - the girls went to see Treasure Planet, and Karen and Frank watched Die Another Day. Then we all saw Harry Potter. It was great! The next morning, as we pulled up anchor, we had something bad happen. The anchor windlass (a winch that pulls up the chain) pulled out of it's bolts! Apparently it had been loosening for some time, we hadn't been checking it, and it finally pulled the few threads it was still using out of the bolt holes. So, we spent the morning finding a mooring, inspecting the windlass, removing the windlass, and then finding somewhere to take the windlass to have new threads installed. Sigh. That evening, after some more shopping and boat maintenance, we noticed a familiar catamaran arrive by the name of "Hotel California". We had seen their boat in St. John and heard they had 4 young kids on board. We were anxious to visit them, but as they just arrived in the evening, we thought we'd wait until the morning. The next morning, just as we were about to go over and greet them, they pulled up and started to head back out through the bridge. We rushed into our dinghy and went over. We told them we had seen them before and our kids were anxious to meet them. They told us they were going to Phillipsburg and would be spending several days there. We told them we'd be there the next day we hoped - and they left. Well, it wasn't until the next afternoon, Wednesday, December 18th, that the windlass was repaired. In the meantime, we did more Internet, grocery shopping, boat maintnance, and home schooling. As soon as the windlass was done, Frank worked diligently to install it properly. It took a couple of hours, but the work was done. He also re-repaired the starboard nav light which had corroded on one of the wiring connections. This time Frank did a better wiring job and applied marine grease to the connection to protect from corrosion. 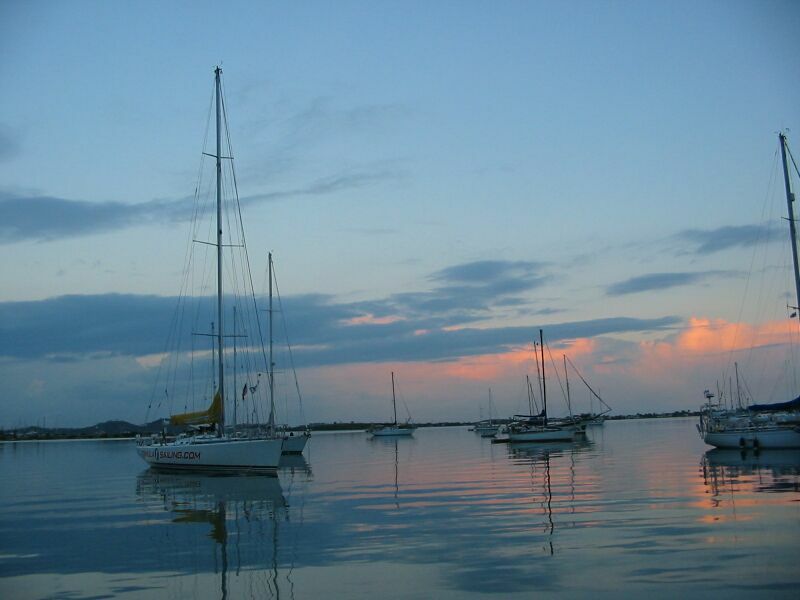 Here are some pictures of Simpson Bay Lagoon. The third picture was of the wildest paint job we've seen on a sailboat yet. The last picture is outside the lagoon - as we left Simpson Bay. Late that afternoon we motored over to Phillipsburg (the winds were light) and out far enough to empty the holding tanks. We arrived just after sunset with a nearly full moon rising. 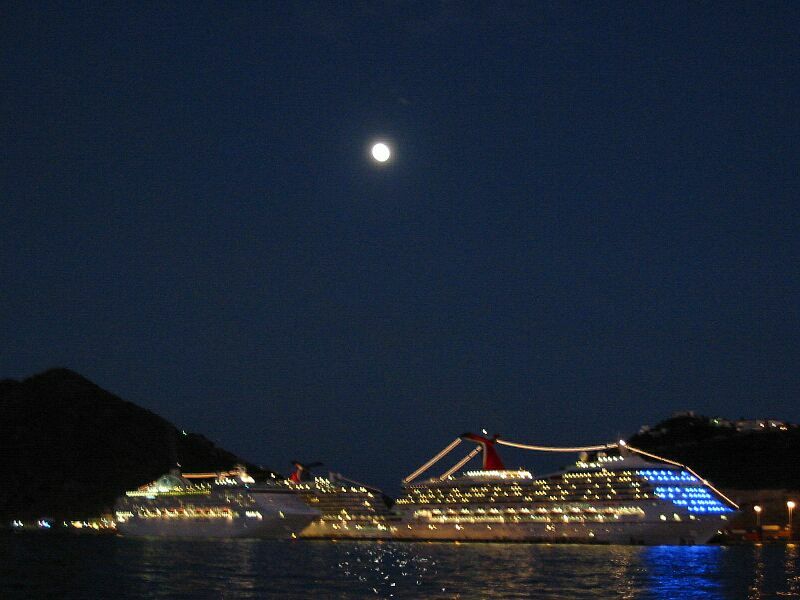 There were four cruise ships in the harbour. It was a beautiful sight. Hard to capture in low light with a camera on a moving boat though. Here's a picture or two. Hotel California was there, and we anchored nearby. But, they weren't on board. We speculated they were at a hotel since they never came home that night. Turns out we were right. A relative had paid for them for four nights at a hotel as a Christmas present. We ended up visiting them at their hotel, swimming in their pool, and going to dinner together. They are a nice family and we hoped to spend some time with them. Since they're travelling on the same intenerary, it appears we'll have several chances. They're family consists of Wilson, the Father; Elizabeth, the Mom; Collin, oldest boy - 13; Lindsey, oldest girl - 11; Riley - other son, 8; and Jillian, youngest daughter - 5. 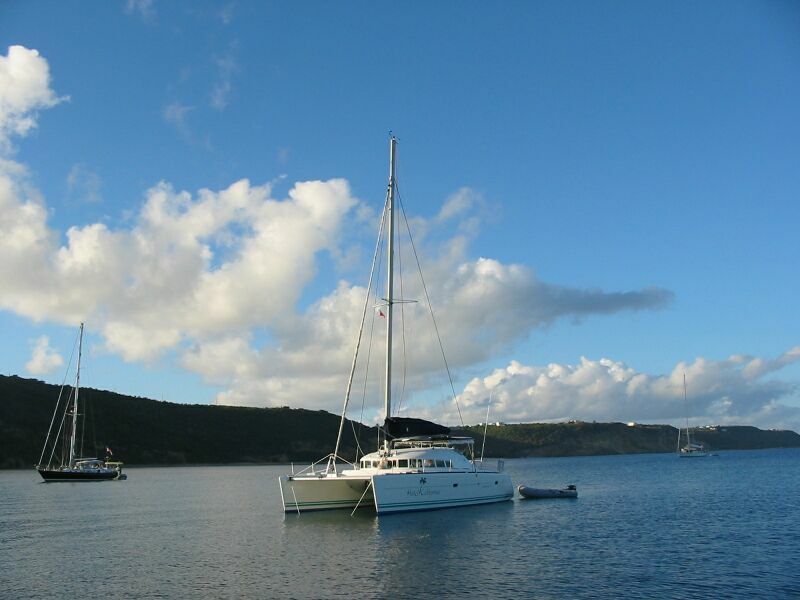 Here's a picture of Hotel California - their Lagoon 41' catamaran. Well, we spent several days in Philipsburg trying to Christmas shop in souvenier shops built for the cruise ships. 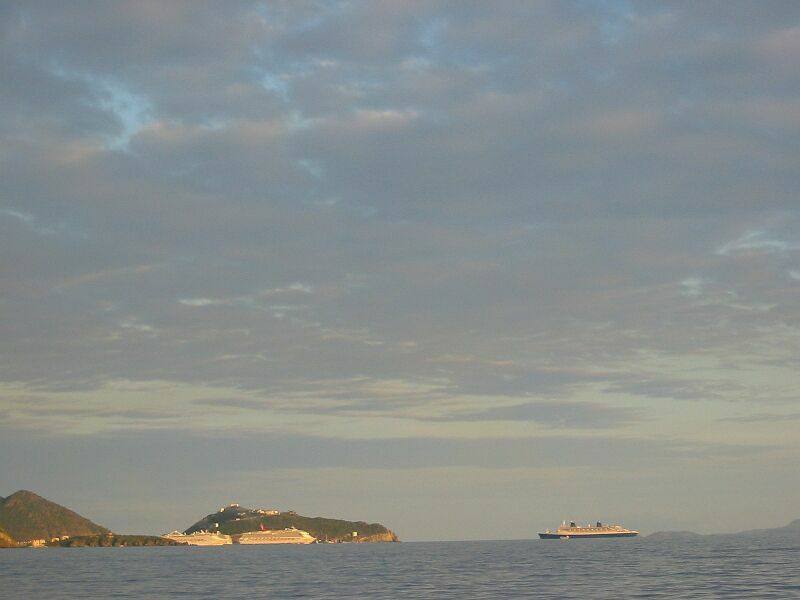 Fortunately, it was a light week of cruise ships here so it wasn't too crowded. We also managed to go see Lord of the Rings: The Two Towers. Only it was the Spanish version (spanish subtitles - make it hard to read the elvish translations :-). During this time we also put some Christmas lights on PatiCat, and bought a little Christmas tree with fiberoptic lights powered by two AA batteries. Finally, on 12/23 we headed with Hotel California back over to Simpson Bay, planning to run a few errands and then clear out. Well, the errands turned out longer than planned, so we ended up staying the night there. We did the Internet, more Christmas shopping, grocery provisioning, buying fuel for the dinghy, etc. That evening, we went with the Walsch's (the Hotel California family) to yet another movie. 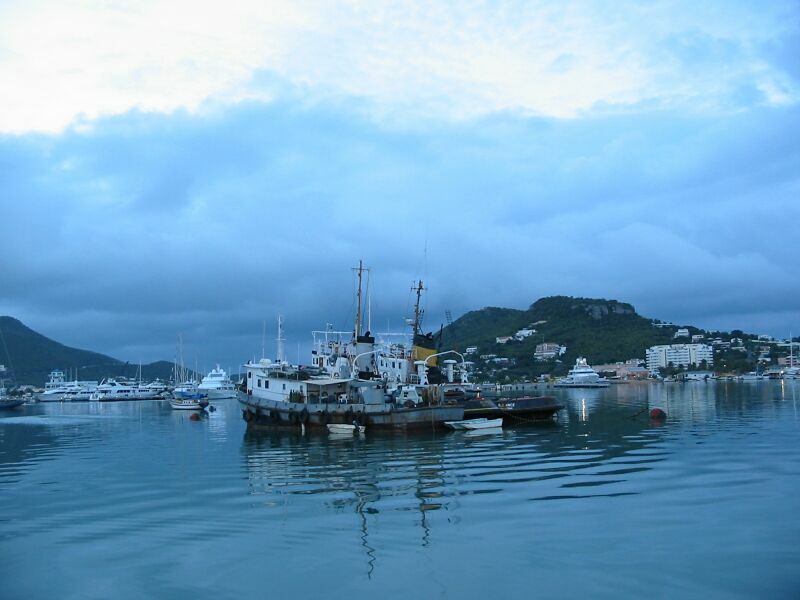 On 12/24 we left early to clear out of Sint Maarten customs and then left from Simpson Bay on our boats. 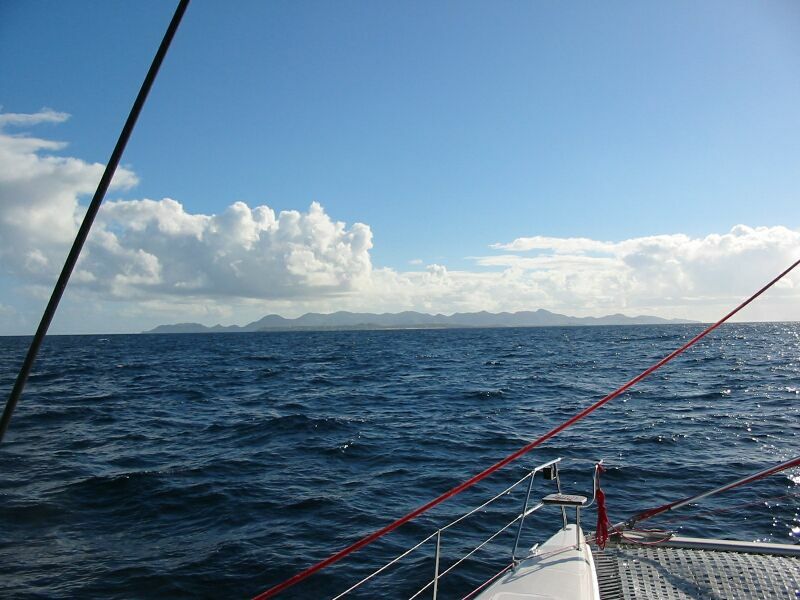 We had a delightful 3 hour sail over to Anguilla's port of entry - Road Bay.